Every day there are media posts, news articles and public announcements commenting on the “skills- both life and soft” necessary for young people to acquire and utilize in order to transition successfully to adulthood. In today’s world, organizations, colleges, and employers are all prioritizing prospective applicants that demonstrate a capability in life skills instead of purely academic achievement. So what are these skills and how can you help your child acquire and master these important tools and competencies? Life skills are important learned abilities and competencies that are essential for individuals, both young and old, to meet the challenges of everyday life. They are the building blocks that allow youth to apply the knowledge they acquire from formal and informal educational activities and experiences, and they are associated with managing and living a better quality of life and helping individuals accomplish their ambitions and living life to the fullest. It is important to note that the relevance of specific life skills is dependent on life circumstances, culture, age, and geography. For example, learning to drive and attaining a driver’s license are skills that would be of greater importance to a teenager in living in Currituck than they would be to a teenager living in New York City. Knowledge, Reasoning, and Creativity (HEAD) which addresses “Thinking” and “Managing” life skills such as decision making, problem solving and goal setting. Personal and Social (HEART) which addresses “Relating” and “Caring” skills such as effective communications, empathy, and cooperation. Vocational and Citizenship (HAND) which addresses “Giving” and “Working” skills like leadership, teamwork, and self-motivation. Health and Physical (HEALTH) which address “Living” and “Being” life skills such as healthy lifestyle choices, self-esteem, and responsibility. 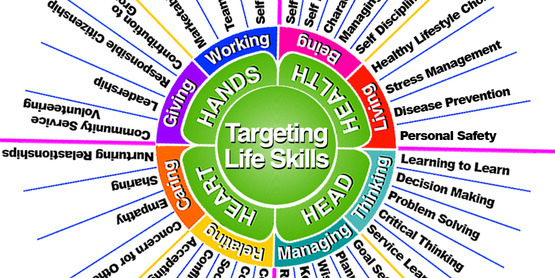 There is a clear relationship between life skill acquisition and quality of life. Programs and activities offered through 4-H provide youth with the means to continuously expand and master skills necessary to become competent, caring, and competitive citizens in their community and world. Each month this year, Currituck 4-H will focus on a different life skill/competency in our educational articles and highlight available programs that provide youth opportunities that promote skill development. It is our purpose to partner with families and grow the next generation of leaders for our community. For more information on 4-H youth programs and activities contact Sherry Fischlschweiger via phone, 252-232-2262, or email, sherry_fischlschweiger@ncsu.edu. 4-H is North Carolina’s largest youth development organization, equipping more than 263,000 young people each year with the skills to succeed and improve the world around them. 4-H programs and camps encourage young people to “learn by doing,” helping them to develop into active, contributing citizens. NC State Extension and the Cooperative Extension Program at N.C. A&T State University coordinate 4-H programs statewide. If you would like to stay informed with the latest news and program information from N.C. 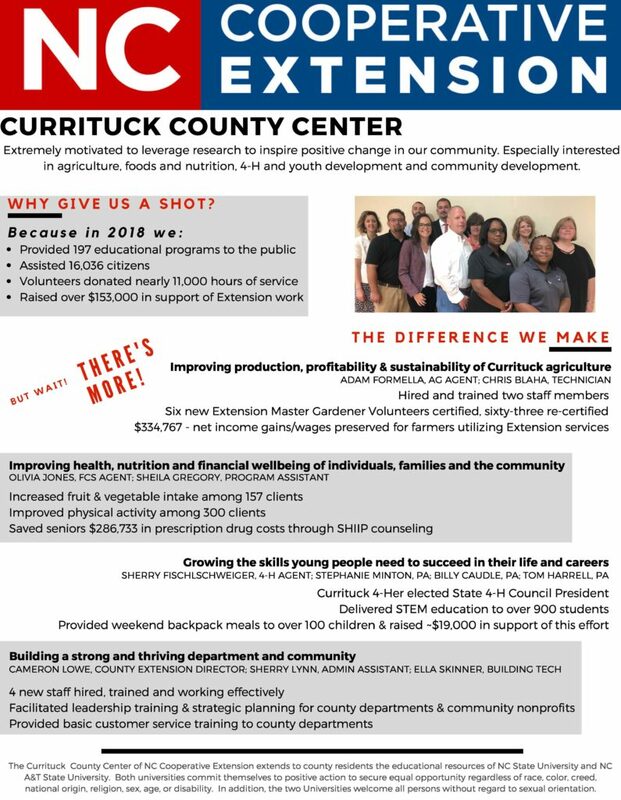 Cooperative Extension-Currituck County Center, please sign up here to receive our monthly online newsletter.